A photographer knows what it takes to get the perfect shot. When you go out and travel in the wild, you are bound to be amazed by the wildlife and nature and so, don’t let a camera shake spoil your once in a lifetime travel shot. If you don’t want to risk blurry shots from those perfect spot photo opportunities, you should go for a specially designed ‘travel’ tripod that is small enough to pack and tough enough to keep your camera steady for night shots, selfie, and amazing interiors. There are hundreds of camera tripods available in the market and that can become a bit overwhelming, therefore you need to narrow down your search process when all you really need is an affordable, reliable way to steady your camera. If you’re searching for a tripod that you can travel with, you’ll need something lightweight and small and if you’re in a studio, you can work with something heavier. There are as many models for your different needs, which you need to sort out before purchasing the stand. There are tabletop tripods, tripods for iPhone, monopods, tripod legs, ball heads and so many more. Choosing the best tripod for your camera can be tricky because the options vary considerably in size, price, and features. Therefore, we have tried to prepare a guide to include not just regular tripods that fold down to suitcase sizes, but even smaller tripods that might fit in a shoulder bag or backpack and table-top tripods for a coat pocket. You should never compromise on the quality of the material being used in the construction of a tripod stand. There are two most common materials used for tripod legs, namely Aluminium and carbon fiber. Aluminium tripods are cheaper, but weigh more and are ideal if you want maximum stability and worth of money. Carbon-fiber tripods cost more but weigh less and absorb vibration better. They are a good option if the cost for you is a less important issue than weight, but remember, the price premium can be substantial. 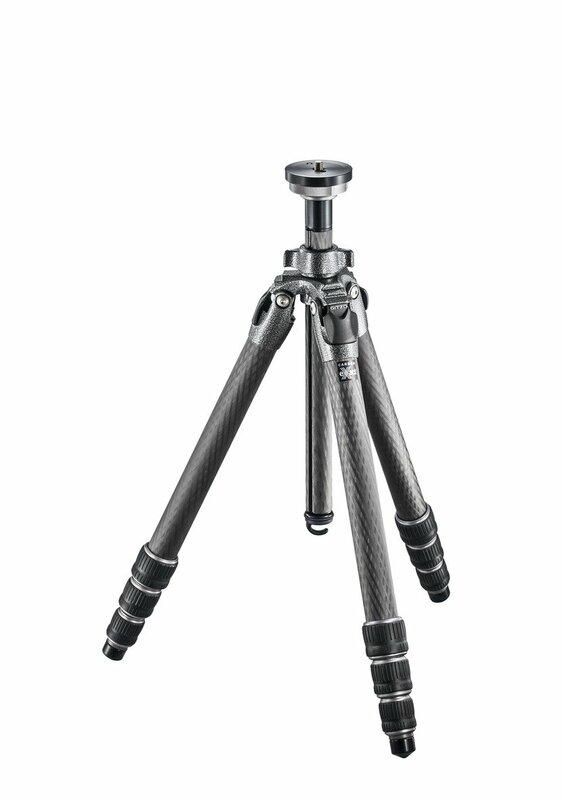 Both are capable of providing very sturdy support, but carbon fiber tripod kits are typically 15% (approximately) lighter in weight than aluminium versions of the same kit. If you want to talk about some attractive feature about the material then, carbon legs look smarter and have more of an appealing factor, but can be more susceptible to shattering if they suffer a sharp knock. Therefore, choose the best material tripod for your camera. 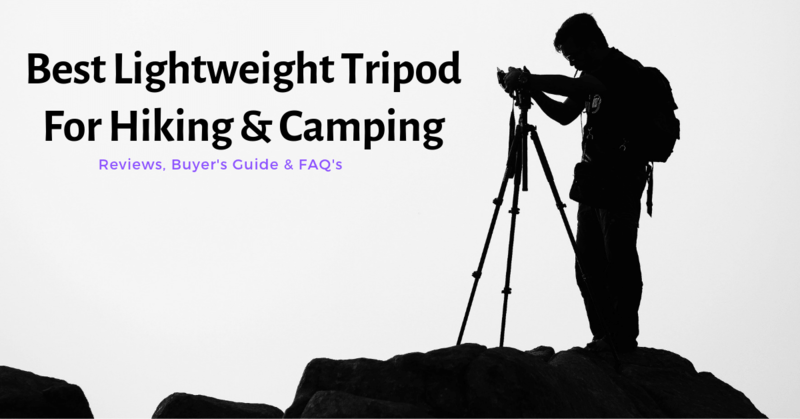 Considering the weight of the DSLR, you need to choose a lighter in weight tripod stand because those DSLR cameras are already a bit bulky as compared to their point-and-shoot brethren. Therefore, if you are always on the go and want to travel light, you’ll want a tripod whose legs collapse as compactly as possible and is also lightweight. Look for a tripod that isn’t too heavy. If you select the right option, you should be able to find a quality one under 5 pounds. These factors should also be kept in mind while choosing the type of tripod stand for your next travel story shots. Tripod legs may have three, four or five sections. A larger number of sections means that the tripod is shorter and hence, more portable when folded. BUT when there is more section, it can usually take a little longer to set up and may well not be quite as stable. So, if you have the time, do go for an option that has more leg sections. The locks come in two main types: twist locks and flip locks. Twist locks take up less space and are generally are quicker to use and you can often unlock all the leg sections in a single movement when you’re setting the tripod up. On the other hand, flip locks are operated individually and maybe a bit slower than twist locks. Therefore, you should try both types to see which you prefer more and then finally select the model. This is an optional point when it comes to tripod stands. Sometimes the tripod head is included, sometimes not. You can change one head for another depending on how you like to work. The most common types of the head are ball heads and three-way heads. Ball heads are compact and quick to use, but not so good for small and controlled movements. While three-way heads are larger but allow precise adjustments for each axis independently. While these two types are common, there are also other, specialist heads like geared heads that allow you to make fine adjustments to camera angles. Then, there are gimbal heads, which are designed for use with long, heavy lenses and can otherwise unbalance a tripod. Every tripod needs ahead, and the smart option is ball heads. 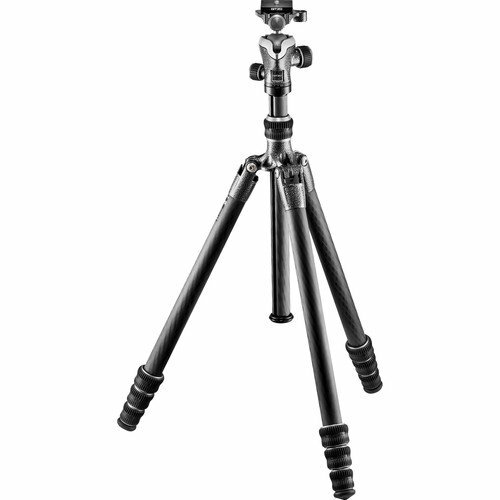 The Gitzo GT3542 Mountaineer is an ‘all-purpose’ carbon tripod stand, that can be said to be both, extremely rigid and light in weight. 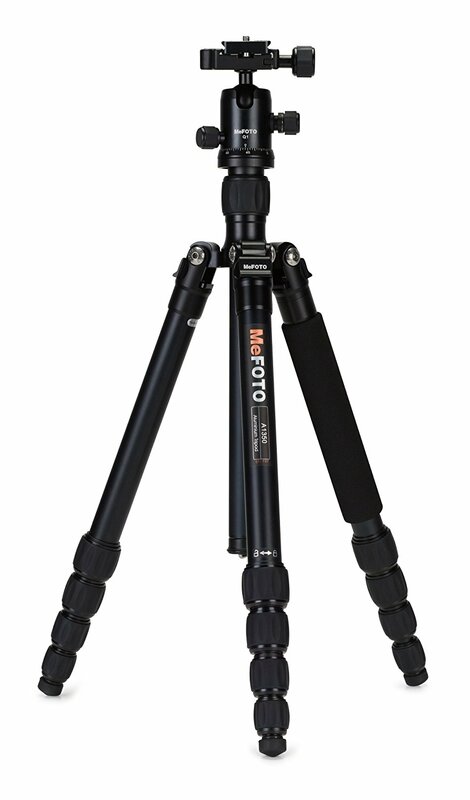 This model is quite a popular choice in the list of tripods in the Gitzo range. The tubes featured in the stand, ‘Carbon exact tubing’, includes High Modulus carbon fiber in the lower leg sections, adding to their diameters and making the tripod more rigid and stronger than its predecessor. This is all because of the redesigned G-lock system, ground level set mechanism and leg angle selectors. 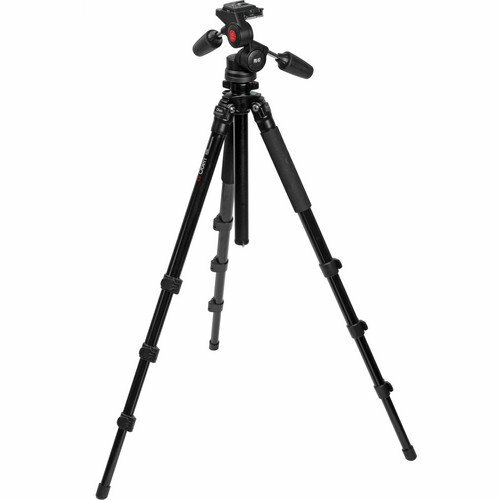 The stand is of a standard-height with 4-sections that are secured with twist locks and incorporate G-lock Ultra, which has an internal O-ring to prevent dust and particles from entering the leg system and is a series 3 tripod. It also has a leg angle selector with spring. The GT3542 has a load capacity of 46.3 lb, extending to a maximum height of 63.8″, and folds down to 21.3″ for transport. The center column on the tripod can be removed for Ground Level Set, which enables the tripod to reach its lowest height of 5.9″. The top spider has been redesigned to add rigidity, and large leg angle selectors give you more area to grip when readjusting leg angles. A ballast hook on the center column allows you to add weight to increase the tripod’s stability. This tripod stand is mostly recommended for professional cameras with 300mm lenses. The MeFOTO Classic Aluminium Road trip is MeFoto’s bestselling DSLR tripod, that is used by both professional and amateur photographers around the world. There are a number of colour patterns available from which you can choose from and show off some serious photography skills. The tripod is a well-designed tripod at an attractive price and you get worth of it too because you not only get a full-featured tripod that can convert into a monopod but also a good quality carrying bag to boot. The stand is a far better choice in the list of tripod stands as they are well padded, stitched thoroughly and built to last. The five extendable leg sections are secured together with grippy, twisting locks, which can be quickly operated with one hand to ‘drop out’ all the sections together. You can also alter the angle of the legs to two lockable positions, allowing you to get your camera set up slightly closer to the ground, or get a perfect and stable shot with the uneven ground surface. By removing and screwing together the center column and tripod leg, you can easily convert the stand into a full-size monopod and they can be folded back again, making it a compact option that will be small enough to fit into some sling bags. The MeFOTO Classic Aluminium Road trip is a colorful, fun, functional, high-quality tripod that’s built to last and easy on the eyes. The AC-1451 4-Section Aluminium Tripod with PD-117 Pan/Tilt Head from Oben is an ideal tripod head for photographers looking for individual control on all axes. This is a sturdy 4-section aluminium leg that can hold a camera or camcorder up to 13.2 lb, and will also extend up to 68.3″. The legs are also non-rotating and have flip locks on each one of them to adjust the height of the tripod. Each one of the legs is independently adjustable and can be locked securely at three different angles. The tripod’s feet feature rubber tips which are great for shooting on slippery or hard surfaces. The center column features a twist lock that frees up its extension and retraction and for extra protection, there’s a rubber damper that protects the center-post collar. At the bottom of the center column, there is a spring-loaded ballast hook that allows you to attach a counterweight for extra stability. There are two locking handles to control the front-to-back and side-to-side tilt, and a thumb screw that locks and unlocks the panning motion. The many features in the stand also include a quick release system that in turn includes an RP-20 plate with a video pin, and a safety lock on the release lever, preventing accidental release of the camera. There are two bull’s eye levels, and three tubular levels, that ensure your camera will be level on both the horizontal and vertical axes. A tool clip with two hex wrenches are also present for adjusting the center column and can snap onto any of the tripod legs for easy access. 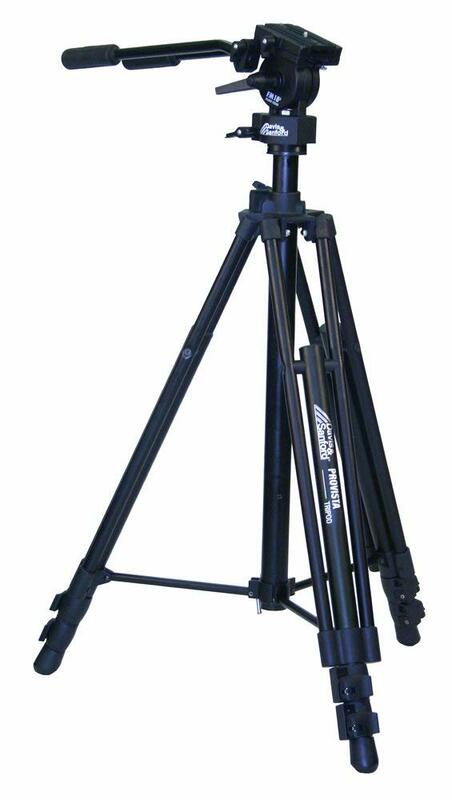 The Provista 18 from Davis & Sanford is a heavy duty, dual strut tripod that is a perfect model for video applications. The geared center post makes raising and lowering the camera quite easy and smooth with a no drift self-locking feature. A center brace with lock, adds great stability, giving you smooth professional videos. The tripod stand is a 2-way fluid head that gives silky smooth pans and has a built-in quick release. High quality padded carrying bag is also included in the package to help protect your stand well. It also includes the ProVista tripod legs and removable FM18 Fluid Video Head. This system provides rigid support for those who need strength more than versatility in height options. It can assemble to its working height very quickly, because of a 75mm claw ball and twist locks which require just half a rotation. The stand is a 3 -section legged with double-strut top leg section for extra stability for your camera. This stand also offers a pivoting rubber foot for use on any surface and two adjustable panhandles for greater control over any land surface. 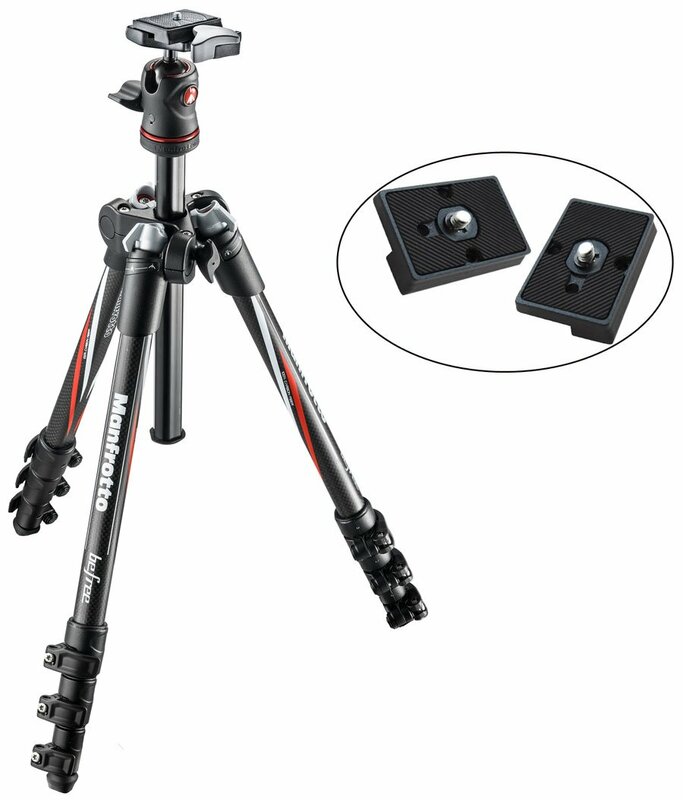 The Manfrotto Befree carbon fiber tripod has a unique folding mechanism in which the legs fold perfectly around the head and comes with quick release plate attachment. It is made of 100 % carbon fiber legs that will guarantee you great lightness while also ensuring rigidity and transportability. The Befree carbon that the stand is made of weighs only 1,1 kg, i.e. almost 20% less than its aluminium version, making it light in weight. It comes with a dedicated shoulder bag to protect it from any accidental damage while also making it comfortable to carry and easy to pack in luggage. The premium Italian design of the tripod stand makes it stands out from the crowd as it is eye-catching and also quite attractive and is also the first tripod with graphics on its legs. The stand takes advanced hobbyists and professionals who are passionate travelers to a new level. This travel photography tripod is even lighter and more compact than before. It’s quite fast to set up and intuitive to use and not forget, also surprisingly stable for capturing stunningly precise and sharp images. Overall, this a great-looking, superbly designed photographic tool that makes it stand out from the crowd and expresses their unique, innovative photographic style. The SIRUI T-1205x Tripod is the perfect compact traveler’s companion for your travel stories. Its easy folding design, it can be reversely folded into a more compact size that can fit the Sirui ball heads in the traveling case. It weighs only about 0.8 kg and can support up to 22 lbs of photographic equipment and is therefore light in weight. It can also stay quite sturdy at the same time. This is a 5-section that is made from 8x carbon fiber that comes with a short center column that you may use interchangeably with the main center column for low-height shooting. Two adjustment settings are also available that click in place automatically to lock the angle. The T-1205x is an ideal choice for use with 35mm photographic cameras, DSLRs and digital or conventional type video camcorders. Instead of using the traditional casting processes that is typical of construction in the tripod industry, SIRUI has tried to adopt the technology of forging, which can produce a piece that is stronger than an equivalent cast or machined part. It also offers you an anodizing surface treatment, produced by an electrolytic oxidation process, that helps increase the thickness of the natural oxide layer on the surface of metal parts. It is applied to increase corrosion and wear resistance, surface hardness and enhance the colors durability. There is a leg warmer on one leg which facilitates handling of the stand in extreme weather conditions and also help to protect the legs. 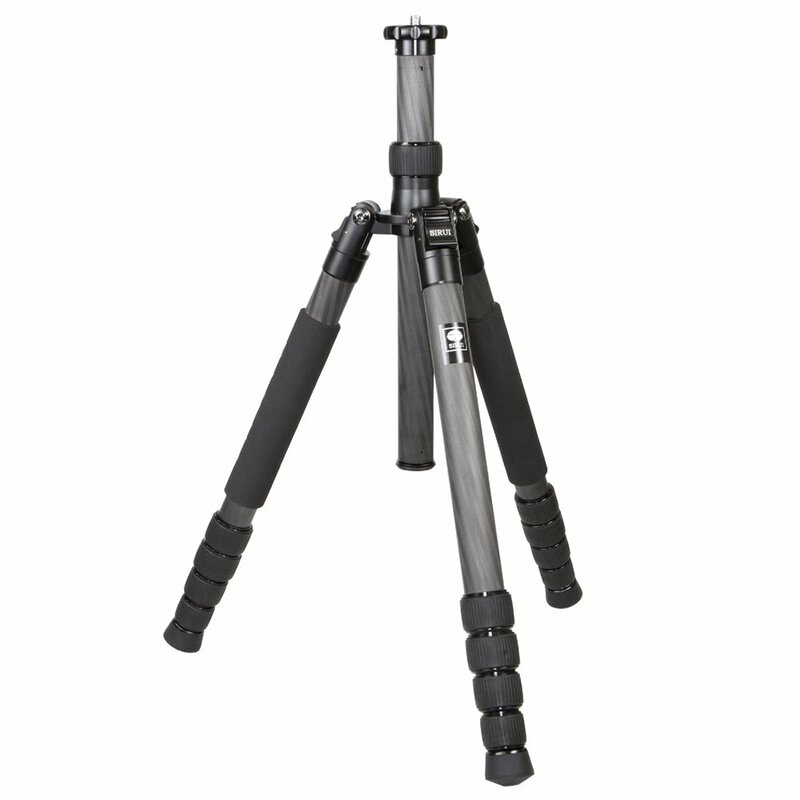 The Gitzo GIGT1545T Traveller Series 1 Carbon Fibre Tripod is a compact stand in nature with legs that fold around the center column and also comes with an optional head. These reverse-folding legs contribute to the tripod’s folded length that comes down to just 16.7″. It can extend up to 60.2″ high and can hold up to 22 lb worth of gear. With the included short center column installed, the tripod can get down to 8.6″ for a macro or low-angle shooting. The tripod also employs Carbon exact tubing for offering the added strength and stiffness as compared to the Carbon 6X tubes. The stand has a traveler G-lock that is a pared-down version of Gitzo’s G-lock, specifically designed for the Traveller tripods to reduce its overall size. These legs feature a space-saving foot that can easily fit the compact design into the carrying bag that comes with the kit. A shoulder strap is also included for easy carrying and transportation. With the Gitzo traveler stand, you can enjoy a lightweight, stable, and smooth support system with a center ball head kit. Do I really need a tripod? Photography always means to open your lens for a short amount of time to allow light to hit the camera sensor. During this short amount of time, every kind of movement of the camera will harm your photograph as it will become fuzzy and out of focus. That’s why keeping your camera as steady as possible is a prerequisite to taking proper photographs – and exactly for this, tripods have been invented. How much do I need to spend on a tripod? The amount of money you should spend on a tripod vastly differs, depending on your budget and if you are a pro or just an amateur. The cheapest tripods on Amazon or local dealers start at just 30 US dollars, but you will get what you pay for. For what it’s worth, you should spend at least 190 USD on a proper tripod kit to start out. There are plenty of good lightweight travel tripods to be had for that amount of money. If you are willing to spend around 500 US dollars you will be able to get a great tripod for professional needs and you can even spend way more than that if you’re willing. How to clean and maintain a tripod? Tripods should be kept dry all the time to prevent it from taking damage over time. This is why you should have a microfiber cloth with you if possible, to keep it dry and clean. You should definitely not use water or other fluids on it, to be honest. When you store your tripod, you should put it into its bag and store it horizontally in a dry and dark place. Avoid locking the legs to firmly though as it might damage the legs as well. What is a ball head? Ball Heads work by putting the camera on a metal ball that is housed inside the tripod head. This ball head allows a seamless movement in all three axes. To adjust your camera position, you just turn one single knob which will allow you to rotate if freely. Another turns on the knob in the other direction will lock the camera position again. The main advantage is that you can adjust the camera position way quicker than with a 3-way head, and at the same time save some space as you just have one adjustment knob. The drawback though is that you cannot change your camera position as precisely as with a 3-way head. A tripod may add a bit of extra weight to your camera bag, but having one available when you are out shooting, could mean the difference between a blurred shot and a pin sharp one. Using a good quality tripod for photography gives you the time to really hone in on your composition, letting the tripod support the weight of your camera while you think it all through. So, don’t wait up and choose the best lightweight tripod for backpacking as per your wishes and desires from the above list and just go for it.